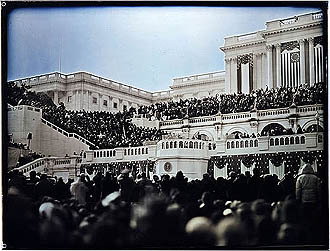 “The Inauguration, January 20, 2009” is a daguerreotype of President Obama’s inauguration by Jerry Spagnoli. Jerry Spagnoli set his alarm for 3 a.m. the day of President Barack Obama’s inauguration to begin the time-consuming process of preparing daguerreotype plates. His request for press credentials to photograph the ceremony, bogged in Washington bureaucracy, had been granted at only 9 the night before. It was still dark when he lugged his equipment to the Mall to stake out a spot, and then waited for hours in the 20-degree cold. The effort was worth it. “The Inauguration, January 20, 2009” captures that day in a unique manner, combining an anachronistic technique with an event that was simultaneously contemporary and historic. One of the highly detailed, one-of-a-kind images is now in the permanent collection of the National Portrait Gallery in Washington. The other is on loan from the artist to the exhibition “Digital to Daguerreotype: Photographs of People,” recently opened at Carnegie Museum of Art. Spagnoli’s is among 73 photographs from the Carnegie and private collections that investigate technical processes, and the human as subject, over 160 years of image making. They also show the mix of educator, curator, historian and aesthete that Linda Benedict-Jones brings to her role as the first curator of the newly created Carnegie photography department. In this, her first exhibition since her appointment, Benedict-Jones cleverly seduces visitors with large, brightly colored contemporary works up front, then travels back in photographic history. Just past the case holding 19th-century daguerreotypes is Spagnoli’s image, bringing the exhibition full circle. Of particular interest are Duane Michals’ 1958 photographs of Andy Warhol and his mother, Julia Warhola, shot before either Pittsburgh artist had gained international recognition, and two photographs taken and hand-colored by the late Charles “Teenie” Harris. Also note Antonio Pardo Soublette’s genteel 1916 “Portrait of Marie Louise Pardo de Leygimer,” an autochrome Lumiere displayed in a light box but probably originally held up to sunlight for illumination, and Larry Clark’s raw “Tulsa” series images, photographed 15 years before his documentary “Kids” and as provocative. “Digital” continues through Jan. 31. Hours are 10 a.m.-5 p.m. Tuesday through Saturday, noon-5 p.m. Sunday, and until 8 p.m. Thursday. Admission is $15; seniors $12; students and children ages 3-18, $11; under 3 and members free. Information: www.cmoa.orgor 412-622-3131.At 6 p.m. July 16 a free program addresses “Early Photography: New Uses for Old Techniques.” A cyanotype workshop will be held July 11, beginning in the exhibition and ending in the Carnegie Mellon University darkroom ($24, $20 members, materials included; register at 412-622-3288). Benedict-Jones is co-organizer with Michigan-based curator Howard Bossen of “World of Steel: 150 Years of Photographs,” a major upcoming exhibition. But she also has ideas of her own that she’d like to develop, including a show featuring Paris done in collaboration with colleagues in other museum departments. In her proposed collecting plan, she recommended expanding that part of the collection and, with approval, purchased works by such contemporary Pittsburgh photographers as Sue Abramson, Charlee Brodsky and Dylan Vitone (all included in the exhibition). She also plans to fill historic gaps and to “pay attention to contemporary photography in general. Like other [Carnegie] collections, we want photography to be international in scope.” To achieve that, Benedict-Jones intends to work directly with photographers she’s met over her career, as well as with galleries. She has both the scholarly and experiential chops to do that, dating back to graduate school at MIT where she met, and photographed with, such eminent photographers as Lee Friedlander and Robert Frank. Others, such as William Wegman, she met while serving as Polaroid Collection curator, or, as Manuel Alvarez Bravo, while living in Europe. We may count on Benedict-Jones combining her intimate experiences with the latest expression in the medium to amuse, inform and often amaze. Post-Gazette art critic Mary Thomas can be reached at mthomas@post-gazette.com or 412-263-1925. My fixer smokes constantly, has the worst psoriasis I’ve ever seen, has an arthritic arm that for a while would only move in one direction. If you don’t understand him he gets flustered and says the same thing over again only louder, he periodically spits food on me or into my food and he has the most disgusting snoring I’ve ever heard in my life. He usually starts smoking next to me when I am about half way through my meal… spewing smoke and ash all over my food. He brought one small bag for this trip... it has a couple of extra shirts and four cartons of cigarettes. That said, he is a solid, nice, very bright guy.